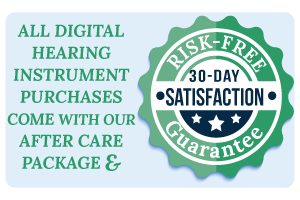 Hearing aids are delicate instruments that are vulnerable to moisture and dirt. These sophisticated devices need regular care and maintenance in order to work effectively. When you remove your hearing aids, wipe them carefully with a dry, soft cloth or a specialized product such as Audio Wipes, which safely clean and disinfect the hearing aids and their earmolds. Inspect the portion of the hearing aid that fits down into the ear canal. Remove any visible earwax using the cleaning tool provided with your hearing aids–this is usually a brush or wire pick Open the battery door and place your hearing aids in their case. Although your hearing aids may have an on/off switch, opening the battery door will help to reduce the affects of moisture and prolong battery life. We recommend investing in a hearing aid storage container specially designed with a dryer or desiccant to remove moisture from your hearing aids. There are also special sprays you can purchase that are designed specifically for the cleaning and disinfecting of hearing aids without causing damage to the hearing aid shell, earmold or circuitry. The Dry & Store Global II is a drying and storage solution for all types of hearing aids, cochlear implant hardware, and other hearing instruments such as ear monitors and noise maskers. Call us today for more information about Dry & Store. Do not use solvents or alcohol on the hearing aids as there is a possibly that they can breakdown the hearing aid material or damage the circuitry. Do not place the hearing aids in direct heat; this includes leaving them in sun or in the car, placing them in a microwave or conventional oven, using a hair dryer on them. Do not allow your hearing aids to get wet. This includes showering or bathing, going to the swimming pool or sauna, and submerging your hearing aids in any kind of liquid for any reason. Do not drop your hearing aids. Your hearing aids may survive a fall on a carpet or other soft place, but hard surfaces can damage your hearing aids. As a precaution, we recommend placing a towel or other soft “landing spot” near the place where you are inserting or removing your hearing aids. Do not leave your hearing aids, hearing aid batteries or hearing aids care products within the reach of children or pets.